German companies could pull investment out of Scotland if post-Brexit trade becomes too difficult, a leading industry group has said. German companies such as manufacturer Siemens and supermarket Lidl employ thousands of people in Scotland. German business leaders have come to Scotland to press the case for the UK to maintain free trade after Brexit. Mr Altmann told BBC Radio's Good Morning Scotland programme that most German companies wanted to see the UK in a customs union, which would mean no taxes on goods moved between EU countries and the UK. The Scottish government's preferred departure option is to stay in the single market, but Prime Minister Theresa May has said Britain will leave the customs union, in favour of an alternative trade deal. Mr Altmann, who works for accountancy firm Blick Rothenberg, told the programme: "German businesses feel frustrated and almost disappointed that there's still no prospect at what the trading relationship with the UK will look like after Brexit. "The possibility of a no-deal scenario, which could see the introduction of import procedures for goods - and potentially customs duties to pay - is a real threat to any European business trading with the UK." Germany is one of the biggest foreign investors in Scotland - putting in an estimated £8bn over the last decade, while Germany is Scotland's fourth biggest export market. "The Scottish government has said that it prefers a customs union between the UK and the EU going forward, and I think this is welcomed by the majority of businesses in both countries," said Mr Altmann. "Since the Brexit referendum, direct foreign investment in the UK and Scotland in particular has slowed down significantly and has, in the last 12 months, almost come to a halt. "The risk is that investors from Germany and other European countries lose their confidence further and not only stop investing in Scotland, but also move operations away, which could be very costly for the Scottish economy." 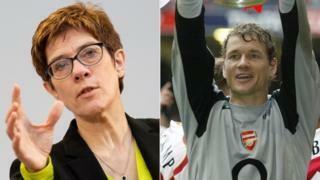 Leading German figures, including former Arsenal goalkeeper Jens Lehmann and Annegret Kramp-Karrenbauer, who is tipped to be the next German Chancellor, have written to the UK asking it to stay in the EU. Mr Altmann's comments came amid renewed concern that Scots firms are not ready for Brexit.